BEST IN CLASS! What would you give to restore your most technical (typically expensive), breathable waterproof/repellent gear back to its original functional state? What you give to add durable water resistant (DWR) finish capability to a favorite synthetic fabric item, that did not have it in the first place? What if this just costed $1 to 4 per item, and can be done at home ... without the need for a Flux Capacitor or Hot Tub Time Machine? 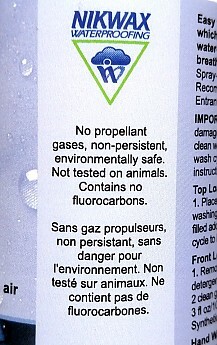 Would it make you happy if there were no persistent chemicals added into the environment, that you are trying to see, while using this gear? 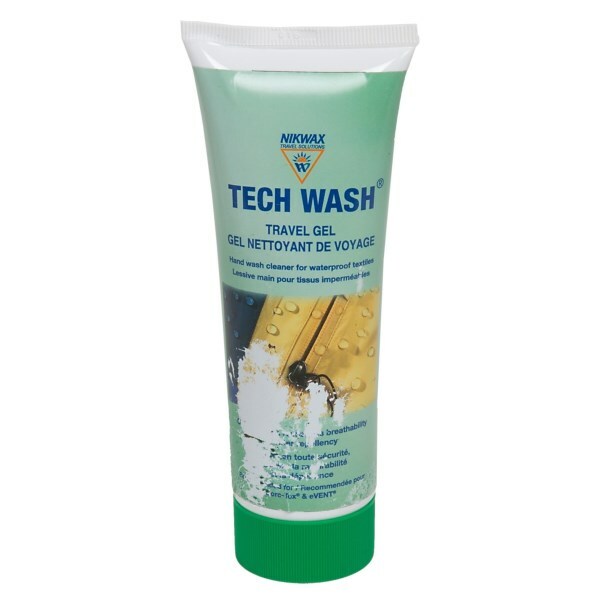 Consider giving Wash-In a try. Worked GREAT for me, so far, on a variety of gear. Environmentally friendly, biodegradable, does not persist! Not free: not included with original techwear purchases ... it should be, at least a coupon! Odd how the label says use 10 oz to treat. My 10 oz bottle should just say use the WHOLE bottle. Number of items treated per bottle stated as 3. I get more when using smaller items. 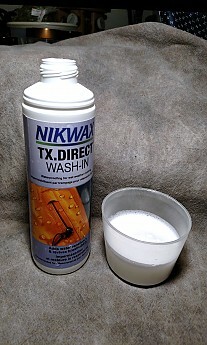 Over the last few years, I'm becoming more and more impressed with the products and vision of Nikwax. I've learned with every new one I try, that they must have invested extensive R&D and testing to create their (I'm finding to be) highly effective products. Nikwax does not just put words on a label. They assist me in proving those words out, on my gear, under my home conditions.If you think this is high praise, test Wash-In and see the results for yourself. Out here a working rain shell jacket or pants might just help save my life. In the PNW's cool, often misty wet fall/winter/spring (OK ... even sometimes summer) weather, we take hypothermia avoidance deadly serious (pun intended)! Tomorrow's Saturday hike in the 'Issaquah Alps' will be another rainy, windy ~40°F day. So will sunday be at Heather Lake, on the Mountain Loop Highway. AH YES, we live in truly a hikers paradise ... provided that our membrane and finish protected gear all works as expected. 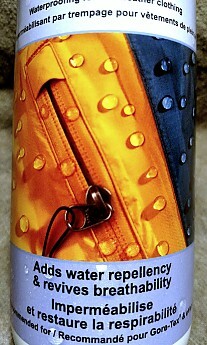 It has been reported and/or I have tested it on Gore-Tex, eVent, Ventia, and Pertex clothing with success. All my membrane gear works, as well as some the DWR protected gear I've tried from Outdoor Research, Columbia, Nike and others. Some of these had stopped working and were restored by one Wash-In treatment! Wash-In is NOT magic. It is just good material science and applied chemistry. What a Durable Water Resistant (DWR) finish looks like in action on my Outdoor Research Ferrosi Hoody (I really like this clothing piece and have four of them for different uses). The video I just took of my black one this morning, is with room temperature tap water, pouring on my jacket's wrist area. This jacket comes waterproofed. 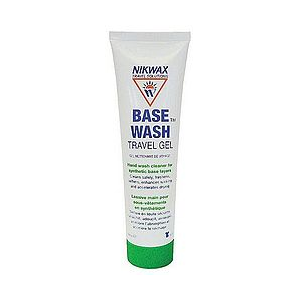 I can use it doing 1-2 years of ~weekly washings of this type of jacket, as long as I use Nikwax Tech Wash or Sports Wash (they both work the same for me and the later costs less). However, if we by mistake wash this jacket JUST ONCE in Tide or Costco High Efficiently Laundry soap, these strong detergents, in cold water, strip the finish off the clothing in that one washing! And in the field, it was horrifying to discover at the rain started that the protection was gone! One treatment with Wash-In restored it for extended use again. 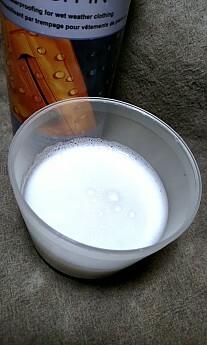 Wash-In is a thin milky emulsion that visually reminds me of cow 2% fat milk. However, it is much more expensive and I suspect works much better on hiking gear than milk. I did not taste it, nor do I plan to yet, based on its non-milk-like fragrance alone. What is magic is that Wash-In goes on white and dries clear, much like how white Elmer's Glue ends up clear on my hiking jacket, when I borrow it for garage chore uses. However, dried on Wash-In is thinner than dried on glue ... in fact it is invisible. However, it sticks on the synthetic fabrics I tend to use in hiking, about as well as glue. With the spray-on, I should be back in business! Rather on the pricy side, but so far worth it. As noted above, I pretty much managed to destroy two rain jackets by neglecting them and running them through the normal wash a few times. Of course, I only discovered my mistake after becoming thoroughly soaked in a big rainstorm, fortunately in the city and not in the mountains! Welcome to Trailspace, Erin! 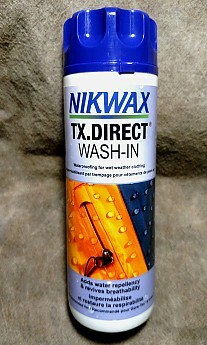 What model jackets were you able to treat with the Nikwax? Pretty amazing product that works! 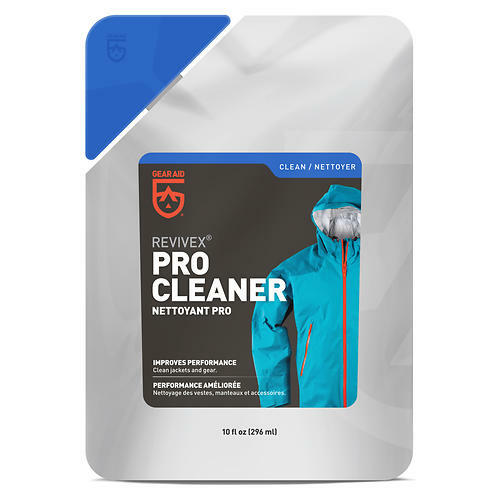 Picked this up and washed a Golite vest, Marmot soft shell, and two kids jackets and was amazed that, after they were dried and I put them under a faucet to test, the water rolled right off all four articles. I would highly recommend this for anyone questioning how water resistant their gear is. It is very easy to use! 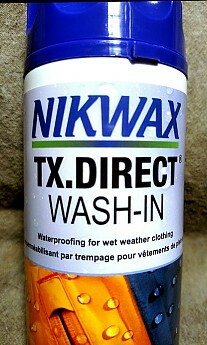 I plan on washing all my outdoor and winter clothing in this stuff! I would recommend getting the 1L size if you're planning on using it on more than three items. . . - - 1 . .
. . - - 33.8 . .